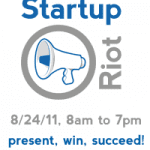 Startup Riot is an affordable one day conference focused on helping startups succeed. Twenty-five startups get on stage for three minutes to present four slides and then they answer questions from a panel of judges for three more minutes. The winners walk away with guaranteed meetings with top investors and VCs as well as exposure to a pre-screened audience of attendees. We’re putting our philosophy of having a high quality event focused on startups on the road. We’re expanding to Seattle this year. Do you know of an awesome startup that should present or an awesome person who should attend? Let them know about us! And if you’re one of these people – we want you there! You can find more info and apply online . Pricing information can be found here.